TUCSON, Ariz. – Sun Tran and City of Tucson’s Department of Transportation have launched the SummerGO Youth Pass pilot program, available for purchase now through June. The new Youth Pass provides high school-aged students with a valid student ID, unlimited rides on Sun Link, Sun Tran and select Sun Shuttle routes as well as unlimited use of City of Tucson pools from May 22 through August 5. Additionally, the SummerGO Youth Pass offers pass holders special summer discounts at Skate Country, Funtasticks Family Fun Park and Goodness Fresh Food and Juice Bar. The pilot program launches in time for the summer vacation, providing an ideal transit option for teenagers and an alternative to the current 1-Day and 30-Day pass options. Sun Tran Special Services Office – 35 W. Alameda St.
Sun Tran Administrative Office – 3910 N. Sun Tran Blvd. Archer Neighborhood Center and Pool – 1665 S. La Cholla Blvd. Donna R. Liggins Northwest Neighborhood Center – 2160 N. 6th Ave.
El Pueblo Activity Center – 101 W. Irvington Rd. El Rio Neighborhood Center – 1390 W. Speedway Blvd. Santa Rosa Neighborhood Center – 1055 S. 10th Ave.
Udall Pool and Recreation Center – 7200 E. Tanque Verde Rd. Clements Pool – 8155 E. Poinciana Dr.
Freedom Pool – 5000 E. 29th St.
Mansfield Pool – 2000 N. 4th Ave.
Additionally, select high schools throughout the community are selling the SummerGO Youth Pass to their student body. Students are asked to check with their high school’s front office to determine if they are a sales location. Promotional materials can be found on campus at select sales outlet high schools. Pass sales will be tested and then evaluated to determine if the pilot program or similar program will be integrated into the public transportation fare structure on a long-term basis. For additional information on the SummerGO Youth Pass visit www.suntran.com, or call Customer Service at (520) 792-9222. Come get a jump on your holiday shopping. 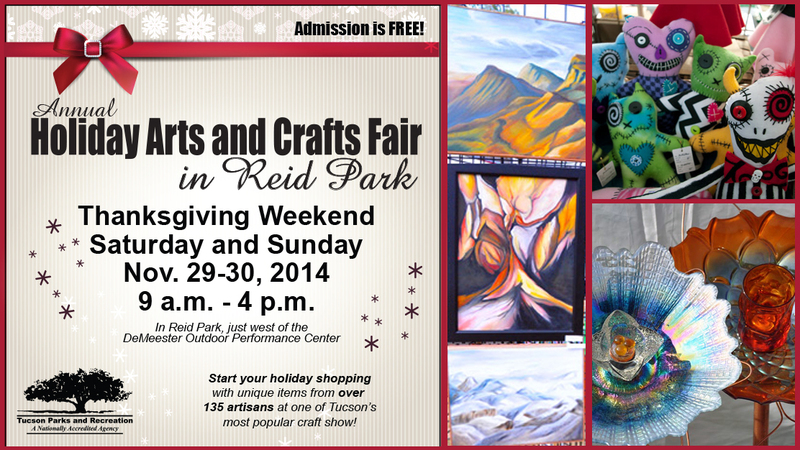 The Tucson Parks and Recreation Department presents the annual Holiday Arts & Crafts Fair Nov. 29 –30, in Reid Park, 22nd and Country Club. It will be located west of the DeMeester Outdoor Performance Center daily from 9 a.m. – 4 p.m. This free event will draw in more than 100 vendors from all over the Southwest ranging from artists, crafters, photographers, painters, potters, jewelers and more. This Thanksgiving weekend fair has become a tradition for many holiday shoppers for more than 20 years. Stroll through the park and visit artists with their original designs, from delicate beading to steampunk jewelry, teapot wind chimes, handcrafted masks, colorful mosaics, sun catchers, and one-of-a-kind ceramics. Discover the artistic redesign of vintage purses, dolls and children’s wear. If you are looking for “cozy,” this is the place for soft blankets and quilts, fragrant soaps, knit scarves of all styles, knit dog collars – and everyone’s favorite – tie dye. Handmade teddy bears, puppets and wooden toys would be perfect for anyone’s holiday gift list. While enjoying the fair, be sure to stop for food and refreshments from local vendors. Visitors are encouraged to use the Concert Place entrance from Country Club Road for ample free parking. For more information call 791-4877. Tucson Parks and Recreation Department presents the 9th Annual Family Festival in the Park. This free community-wide event is about having family fun and a terrific opportunity for Tucson Parks and Recreation to showcase programs and activities offered to the community. This year, we have partnered with the Community Food Bank of Southern Arizona, so please bring a donation of canned goods to the festival to help support its cause. The Tucson Breakfast Lions Club will be offering free vision testing for children and accepting donations of your old prescription eye-glasses. The Lions Club will also offer a free pancake breakfast to kids and those that donate a pair of prescription eye-glasses. The event is expected to attract more than 12,000 Tucsonans. Family activities include stage entertainment, carnival games, inflatables, crafts, golf clinics, tennis games, a tour of the rose garden, and demonstrations of pottery and drawing offered by the leisure class unit. 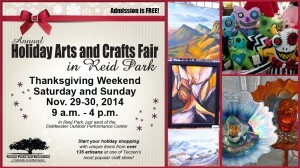 The Reid Park Zoo will have free admission, and the Edith Ball Adaptive Recreation Center will host an afternoon of free swimming from noon to 4 p.m. Tucson City Golf will offer a free 10-minute golf instruction at the Randolph Driving Range adjacent to the park on Alvernon Way, from 10 a.m. to noon. Entertainment will be presented throughout the day and a variety of foods will be available for purchase through local vendors. A special thanks to our event sponsors: Tucson Water, Pyramid Federal Credit Union, CareMore Health Plan, Health Choice Generations, Northwest Medical Center, Bear Essential News, Wendy’s, Macaroni Kid, and Arizona Families. When: Saturday, Nov. 15, 10 a.m-2 p.m.